Team Alpha Male will be on point at the WEC show in Columbus, OH as the third member of Urijah Faber’s team will make an appearance on the card. In a battle of undefeated featherweights, Chad Mendes, will make his promotional debut against Erik Koch. The fight was confirmed to MMAWeekly.com on Tuesday by sources close to the bout who indicated both fighters have agreed to the contest at this point. 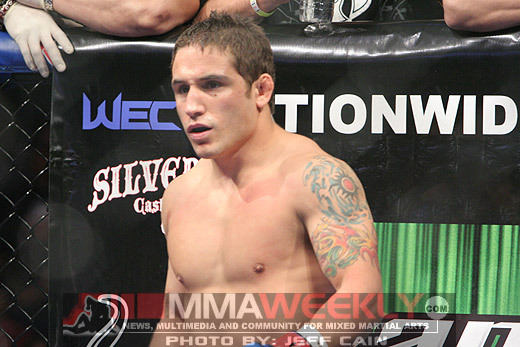 Chad Mendes (5-0) was signed to the WEC several months ago as one of the top prospects to join the promotion. A former NCAA wrestling phenom, Mendes has gone undefeated so far in his professional career, racking up impressive wins over veteran opponents like Mike Joy. Mendes will join teammates, Joseph Benavidez and Danny Castillo, who will also compete on the WEC’s inaugural show in the Buckeye state. His opponent, Erik Koch (8-0), also comes into the fight with a perfect record and a 1-0 mark in the WEC. Koch made his WEC debut in December 2009 with a win over Jameel Massouh, and looks to build on that win as he faces Mendes in a 145lb showdown. The bout between Mendes and Koch will likely end up on the untelevised portion of the Versus broadcast which will be lead by bantamweight champion, Brian Bowles, against top contender, Dominic Cruz.